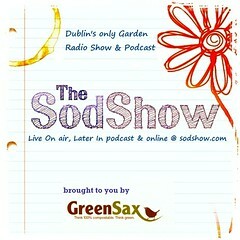 Bernie Goldbach in LSAD-Clonmel | Logo from The Sodshow. THE SODSHOW EARNED "Best Podcast" in the Irish Blog Awards, moving it up in the listening order of my audio subscriptions via iTunes SodShow. I listen to 20 minutes of the Sodshow so I can get in touch with my green side. There's always plenty of gardening advice on the show, produced to broadcast quality. I've been following the airtime adventures of Peter Donegan since the days of "The Sodcast" and was delighted when Peter Donegan and Brian Greene got their slot on Dublin City FM. Earning a "Best Podcast" gong solidifies the show's position near the top of good listening in Ireland. I was in Peter Donegan's back garden when he turned on a shotgun mic for an outdoor walkabout. I think The Sodshow sounds more authentic with its outside air pushing into my inner ear. And that's what it delivers--ambient background noise on location sprinkled with a little Latin for good measure. You don't need to have a garden but you should want to be prodded by Peter with his garden walks and outdoor meet-ups. I'm glad there's an award-winning Sodshow because it makes gardening and the great outdoors happier places when I listen. Bernie Goldbach collects things related to podcasting.